After back-to-back LDS General Conferences full of major changes and more than a year of revisions, reversals and reforms under President Russell M. Nelson, this weekend’s gathering may be remembered more for the words spoken than the actions taken. The 94-year-old “prophet, seer and revelator” and other leaders referenced preparing the world for the Second Coming, warning those who have left Mormonism or never seriously considered joining the church that they’re running out of time. No significant announcements came from the pulpit — outside of naming eight new temples to be built, virtually a conference staple in recent decades for The Church of Jesus Christ of Latter-day Saints. (Trent Nelson | The Salt Lake Tribune) Attendees are seated before the morning session of the189th Annual General Conference of The Church of Jesus Christ of Latter-day Saints in Salt Lake City on Sunday April 7, 2019. (Trent Nelson | The Salt Lake Tribune) Attendees are seated during the morning session of the189th Annual General Conference of The Church of Jesus Christ of Latter-day Saints in Salt Lake City on Sunday April 7, 2019. (Trent Nelson | The Salt Lake Tribune) Elder Dale G. Renlund speaks during the morning session of the189th Annual General Conference of The Church of Jesus Christ of Latter-day Saints in Salt Lake City on Sunday April 7, 2019. (Trent Nelson | The Salt Lake Tribune) Elder Dale G. Renlund speaks during the morning session of the189th Annual General Conference of The Church of Jesus Christ of Latter-day Saints in Salt Lake City on Sunday April 7, 2019. (Trent Nelson | The Salt Lake Tribune) Elder Quentin L. Cook speaks during the morning session of the189th Annual General Conference of The Church of Jesus Christ of Latter-day Saints in Salt Lake City on Sunday April 7, 2019. (Trent Nelson | The Salt Lake Tribune) Sharon Eubank, first counselor in the general presidency of the Relief Society, speaks during the morning session of the189th Annual General Conference of The Church of Jesus Christ of Latter-day Saints in Salt Lake City on Sunday April 7, 2019. (Trent Nelson | The Salt Lake Tribune) Attendees stand at the end of the morning session of the189th Annual General Conference of The Church of Jesus Christ of Latter-day Saints in Salt Lake City on Sunday April 7, 2019. (Trent Nelson | The Salt Lake Tribune) The morning session of the189th Annual General Conference of The Church of Jesus Christ of Latter-day Saints in Salt Lake City on Sunday April 7, 2019. (Trent Nelson | The Salt Lake Tribune) Attendees leaving the morning session of the189th Annual General Conference of The Church of Jesus Christ of Latter-day Saints in Salt Lake City on Sunday April 7, 2019. 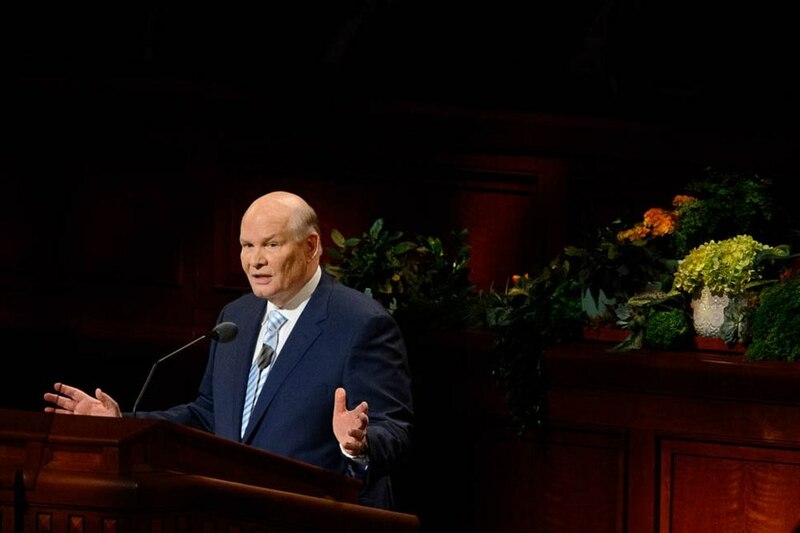 (Trent Nelson | The Salt Lake Tribune) Elder Dale G. Renlund speaks during the morning session of the189th Annual General Conference of The Church of Jesus Christ of Latter-day Saints in Salt Lake City on Sunday April 7, 2019. (Trent Nelson | The Salt Lake Tribune) The morning session of the189th Annual General Conference of The Church of Jesus Christ of Latter-day Saints in Salt Lake City on Sunday April 7, 2019. (Trent Nelson | The Salt Lake Tribune) The morning session of the189th Annual General Conference of The Church of Jesus Christ of Latter-day Saints in Salt Lake City on Sunday April 7, 2019. (Trent Nelson | The Salt Lake Tribune) The morning session of the189th Annual General Conference of The Church of Jesus Christ of Latter-day Saints in Salt Lake City on Sunday April 7, 2019. (Trent Nelson | The Salt Lake Tribune) The morning session of the189th Annual General Conference of The Church of Jesus Christ of Latter-day Saints in Salt Lake City on Sunday April 7, 2019. (Trent Nelson | The Salt Lake Tribune) The Tabernacle Choir at Temple Square during the morning session of the189th Annual General Conference of The Church of Jesus Christ of Latter-day Saints in Salt Lake City on Sunday April 7, 2019. (Trent Nelson | The Salt Lake Tribune) President Dallin H. Oaks speaks during the morning session of the189th Annual General Conference of The Church of Jesus Christ of Latter-day Saints in Salt Lake City on Sunday April 7, 2019. (Trent Nelson | The Salt Lake Tribune) The morning session of the189th Annual General Conference of The Church of Jesus Christ of Latter-day Saints in Salt Lake City on Sunday April 7, 2019. (Trent Nelson | The Salt Lake Tribune) The Tabernacle Choir at Temple Square during the morning session of the189th Annual General Conference of The Church of Jesus Christ of Latter-day Saints in Salt Lake City on Sunday April 7, 2019. (Trent Nelson | The Salt Lake Tribune) President Russell M. Nelson speaks during the morning session of the189th Annual General Conference of The Church of Jesus Christ of Latter-day Saints in Salt Lake City on Sunday April 7, 2019. (Trent Nelson | The Salt Lake Tribune) President Russell M. Nelson speaks during the morning session of the189th Annual General Conference of The Church of Jesus Christ of Latter-day Saints in Salt Lake City on Sunday April 7, 2019. (Trent Nelson | The Salt Lake Tribune) President Russell M. Nelson speaks during the morning session of the189th Annual General Conference of The Church of Jesus Christ of Latter-day Saints in Salt Lake City on Sunday April 7, 2019. (Trent Nelson | The Salt Lake Tribune) President Russell M. Nelson speaks during the morning session of the189th Annual General Conference of The Church of Jesus Christ of Latter-day Saints in Salt Lake City on Sunday April 7, 2019. (Trent Nelson | The Salt Lake Tribune) President Russell M. Nelson speaks during the morning session of the189th Annual General Conference of The Church of Jesus Christ of Latter-day Saints in Salt Lake City on Sunday April 7, 2019. (Trent Nelson | The Salt Lake Tribune) President Russell M. Nelson, with his wife, Wendy, at the end of the morning session of the189th Annual General Conference of The Church of Jesus Christ of Latter-day Saints in Salt Lake City on Sunday April 7, 2019. (Trent Nelson | The Salt Lake Tribune) President Russell M. Nelson speaks during the morning session of the189th Annual General Conference of The Church of Jesus Christ of Latter-day Saints in Salt Lake City on Sunday April 7, 2019. (Trent Nelson | The Salt Lake Tribune) President Russell M. Nelson speaks during the morning session of the189th Annual General Conference of The Church of Jesus Christ of Latter-day Saints in Salt Lake City on Sunday April 7, 2019. (Trent Nelson | The Salt Lake Tribune) President Russell M. Nelson speaks during the morning session of the189th Annual General Conference of The Church of Jesus Christ of Latter-day Saints in Salt Lake City on Sunday April 7, 2019. (Trent Nelson | The Salt Lake Tribune) A kiss received during the morning session of the189th Annual General Conference of The Church of Jesus Christ of Latter-day Saints in Salt Lake City on Sunday April 7, 2019. (Trent Nelson | The Salt Lake Tribune) Attendees during the morning session of the189th Annual General Conference of The Church of Jesus Christ of Latter-day Saints in Salt Lake City on Sunday April 7, 2019. (Trent Nelson | The Salt Lake Tribune) President Russell M. Nelson speaks during the morning session of the189th Annual General Conference of The Church of Jesus Christ of Latter-day Saints in Salt Lake City on Sunday April 7, 2019. (Trent Nelson | The Salt Lake Tribune) Attendees during the morning session of the189th Annual General Conference of The Church of Jesus Christ of Latter-day Saints in Salt Lake City on Sunday April 7, 2019. (Trent Nelson | The Salt Lake Tribune) Tad R. Callister speaks during the morning session of the189th Annual General Conference of The Church of Jesus Christ of Latter-day Saints in Salt Lake City on Sunday April 7, 2019. 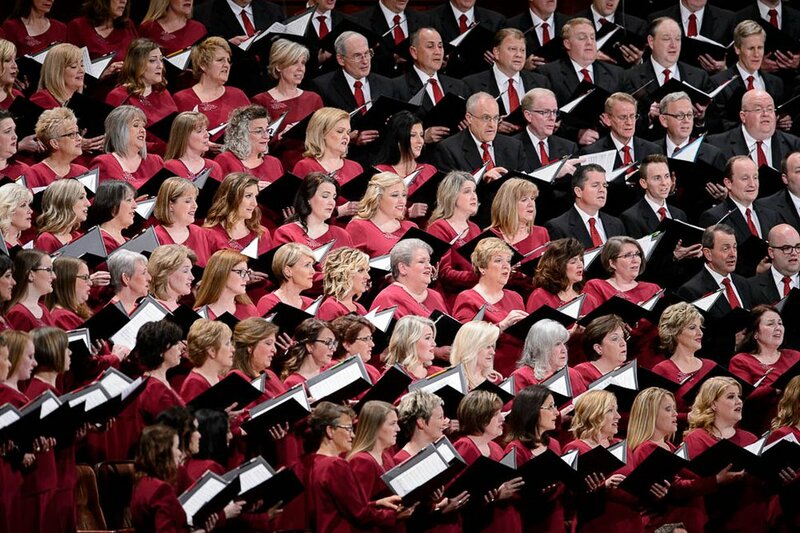 (Trent Nelson | The Salt Lake Tribune) The Tabernacle Choir at Temple Square during the morning session of the189th Annual General Conference of The Church of Jesus Christ of Latter-day Saints in Salt Lake City on Sunday April 7, 2019. (Trent Nelson | The Salt Lake Tribune) Elder D. Todd Christofferson speaks during the morning session of the189th Annual General Conference of The Church of Jesus Christ of Latter-day Saints in Salt Lake City on Sunday April 7, 2019. (Trent Nelson | The Salt Lake Tribune) Sharon Eubank, first counselor in the general presidency of the Relief Society, speaks during the morning session of the189th Annual General Conference of The Church of Jesus Christ of Latter-day Saints in Salt Lake City on Sunday April 7, 2019. (Trent Nelson | The Salt Lake Tribune) The afternoon session of the189th Annual General Conference of The Church of Jesus Christ of Latter-day Saints in Salt Lake City on Sunday April 7, 2019. (Trent Nelson | The Salt Lake Tribune) The afternoon session of the189th Annual General Conference of The Church of Jesus Christ of Latter-day Saints in Salt Lake City on Sunday April 7, 2019. (Trent Nelson | The Salt Lake Tribune) Seen in a one second exposure, the afternoon session of the189th Annual General Conference of The Church of Jesus Christ of Latter-day Saints in Salt Lake City on Sunday April 7, 2019. (Trent Nelson | The Salt Lake Tribune) Gerrit W. Gong speaks during the afternoon session of the189th Annual General Conference of The Church of Jesus Christ of Latter-day Saints in Salt Lake City on Sunday April 7, 2019. (Trent Nelson | The Salt Lake Tribune) President Dallin H. Oaks speaks during the afternoon session of the189th Annual General Conference of The Church of Jesus Christ of Latter-day Saints in Salt Lake City on Sunday April 7, 2019. (Trent Nelson | The Salt Lake Tribune) President Dallin H. Oaks speaks during the afternoon session of the189th Annual General Conference of The Church of Jesus Christ of Latter-day Saints in Salt Lake City on Sunday April 7, 2019. (Trent Nelson | The Salt Lake Tribune) Juan Pablo Villar speaks during the afternoon session of the189th Annual General Conference of The Church of Jesus Christ of Latter-day Saints in Salt Lake City on Sunday April 7, 2019. (Trent Nelson | The Salt Lake Tribune) Juan Pablo Villar speaks during the afternoon session of the189th Annual General Conference of The Church of Jesus Christ of Latter-day Saints in Salt Lake City on Sunday April 7, 2019. (Trent Nelson | The Salt Lake Tribune) Gerrit W. Gong speaks during the afternoon session of the189th Annual General Conference of The Church of Jesus Christ of Latter-day Saints in Salt Lake City on Sunday April 7, 2019. (Trent Nelson | The Salt Lake Tribune) President Dallin H. Oaks, President Russell M. Nelson, and President Henry B. Eyring arrive at the afternoon session of the189th Annual General Conference of The Church of Jesus Christ of Latter-day Saints in Salt Lake City on Sunday April 7, 2019. 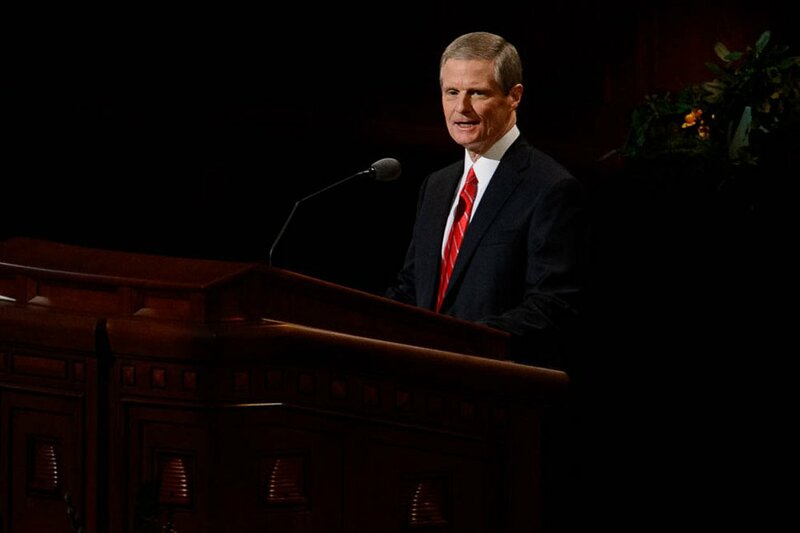 (Trent Nelson | The Salt Lake Tribune) David A. Bednar speaks during the afternoon session of the189th Annual General Conference of The Church of Jesus Christ of Latter-day Saints in Salt Lake City on Sunday April 7, 2019. (Trent Nelson | The Salt Lake Tribune) The Tabernacle Choir at Temple Square during the afternoon session of the189th Annual General Conference of The Church of Jesus Christ of Latter-day Saints in Salt Lake City on Sunday April 7, 2019. (Trent Nelson | The Salt Lake Tribune) The afternoon session of the189th Annual General Conference of The Church of Jesus Christ of Latter-day Saints in Salt Lake City on Sunday April 7, 2019. (Trent Nelson | The Salt Lake Tribune) The afternoon session of the189th Annual General Conference of The Church of Jesus Christ of Latter-day Saints in Salt Lake City on Sunday April 7, 2019. (Trent Nelson | The Salt Lake Tribune) Kyle S. McKay speaks during the afternoon session of the189th Annual General Conference of The Church of Jesus Christ of Latter-day Saints in Salt Lake City on Sunday April 7, 2019. (Trent Nelson | The Salt Lake Tribune) The Tabernacle Choir at Temple Square during the afternoon session of the189th Annual General Conference of The Church of Jesus Christ of Latter-day Saints in Salt Lake City on Sunday April 7, 2019. (Trent Nelson | The Salt Lake Tribune) The Tabernacle Choir at Temple Square during the afternoon session of the189th Annual General Conference of The Church of Jesus Christ of Latter-day Saints in Salt Lake City on Sunday April 7, 2019. (Trent Nelson | The Salt Lake Tribune) Ronald A. Rasband speaks during the afternoon session of the189th Annual General Conference of The Church of Jesus Christ of Latter-day Saints in Salt Lake City on Sunday April 7, 2019. (Trent Nelson | The Salt Lake Tribune) President Russell M. Nelson announces new temples during the afternoon session of the189th Annual General Conference of The Church of Jesus Christ of Latter-day Saints in Salt Lake City on Sunday April 7, 2019. 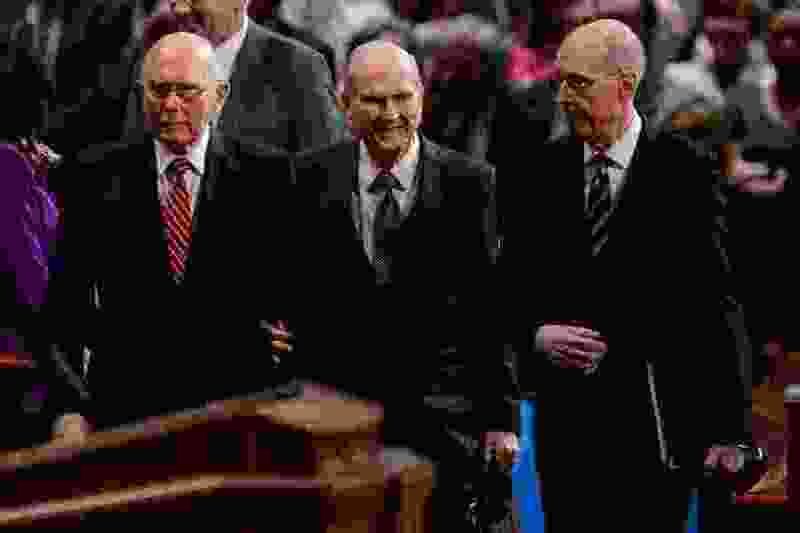 (Trent Nelson | The Salt Lake Tribune) President Dallin H. Oaks, President Russell M. Nelson, and President Henry B. Eyring arrive at the afternoon session of the189th Annual General Conference of The Church of Jesus Christ of Latter-day Saints in Salt Lake City on Sunday April 7, 2019. (Trent Nelson | The Salt Lake Tribune) The Tabernacle Choir at Temple Square during the afternoon session of the189th Annual General Conference of The Church of Jesus Christ of Latter-day Saints in Salt Lake City on Sunday April 7, 2019. (Trent Nelson | The Salt Lake Tribune) The afternoon session of the189th Annual General Conference of The Church of Jesus Christ of Latter-day Saints in Salt Lake City on Sunday April 7, 2019. (Trent Nelson | The Salt Lake Tribune) The afternoon session of the189th Annual General Conference of The Church of Jesus Christ of Latter-day Saints in Salt Lake City on Sunday April 7, 2019. (Trent Nelson | The Salt Lake Tribune) Ronald A. Rasband speaks during the afternoon session of the189th Annual General Conference of The Church of Jesus Christ of Latter-day Saints in Salt Lake City on Sunday April 7, 2019. (Trent Nelson | The Salt Lake Tribune) The Tabernacle Choir at Temple Square during the afternoon session of the189th Annual General Conference of The Church of Jesus Christ of Latter-day Saints in Salt Lake City on Sunday April 7, 2019. (Trent Nelson | The Salt Lake Tribune) President Dallin H. Oaks speaks during the afternoon session of the189th Annual General Conference of The Church of Jesus Christ of Latter-day Saints in Salt Lake City on Sunday April 7, 2019. 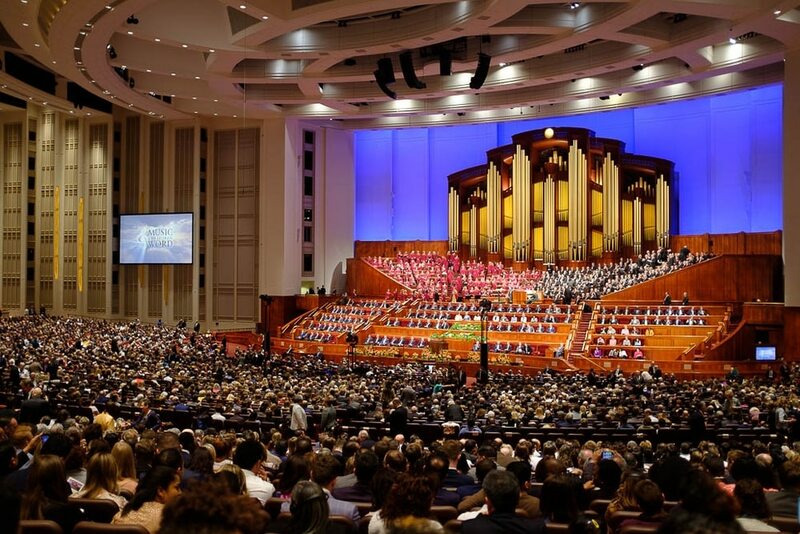 Thousands of church members at the giant Conference Center in downtown Salt Lake City — and millions more watching on TV, the internet or in chapels around the globe — were “instructed and edified,” Nelson said in his concluding remarks. They heard sermons on God’s judgment, eternity, family bonds, repentance, seeking the light of Christ, and the importance of making lifelong commitments. Nelson, who also addressed the faithful Sunday morning, spoke tenderly of his daughter, Wendy, who died three months ago of cancer at age 67. Not true, the Latter-day Saint leader said. “The Savior himself has made it abundantly clear that while his resurrection assures that every person who ever lived will indeed be resurrected and live forever,” Nelson said, “much more is required if we want to have the high privilege of exaltation” and living as families in the afterlife. As president of Christ’s church, Nelson said, “I plead with you who have distanced yourselves from the church and with you who have not yet really sought to know that the Savior’s church has been restored. Do the spiritual work to find out for yourselves, and please do it now. Time is running out." 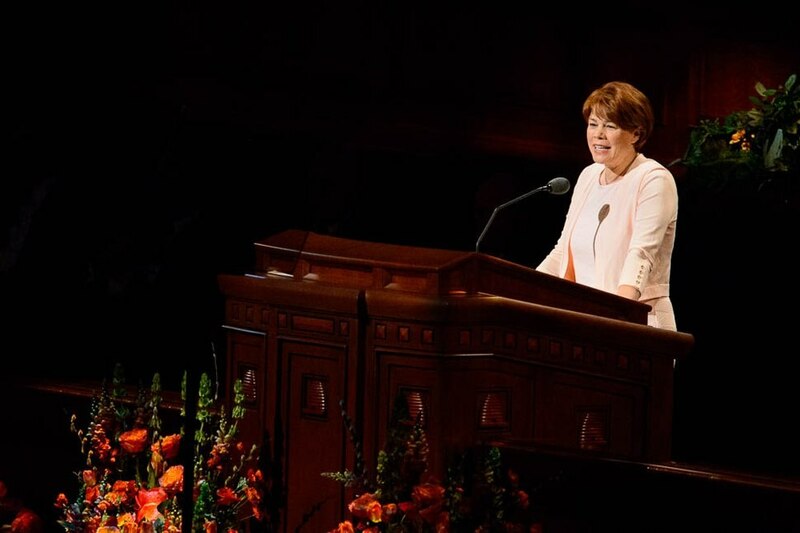 (Trent Nelson | The Salt Lake Tribune) Sharon Eubank, first counselor in the general presidency of the Relief Society, speaks during the morning session of the189th Annual General Conference of The Church of Jesus Christ of Latter-day Saints in Salt Lake City on Sunday, April 7, 2019. Other sermons focused on the redemptive power of mercy, the importance of love in missionary work and vicarious temple rites, and the ability for the faithful to activate heavenly blessings through faith, repentance and good works. Sharon Eubank, first counselor in the women’s Relief Society, discussed the ways that Christ is a light to the world. 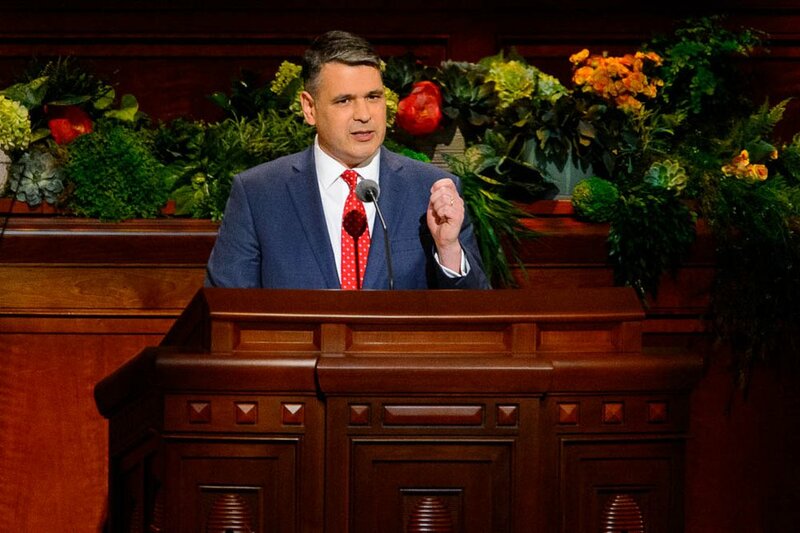 Eubank, director of LDS Charities, the faith’s global humanitarian organization, acknowledged that some believers feel overwhelmed by modern life, weighed down by grief, sorrow, obligations or exhaustion. They feel unaccepted, unworthy or outside of traditional society. In every case, she said, Jesus reaches them and helps them pull their personal yoke. He heals wounds. He provides rest. Dallin H. Oaks, first counselor to Nelson and a former Utah Supreme Court justice, spoke of the difference between mortal judgments and divine judgments. In recent years, more and more Latter-day Saints have resigned from the faith, especially since the enactment of a hotly disputed 2015 LGBTQ policy, which the church discarded last week. 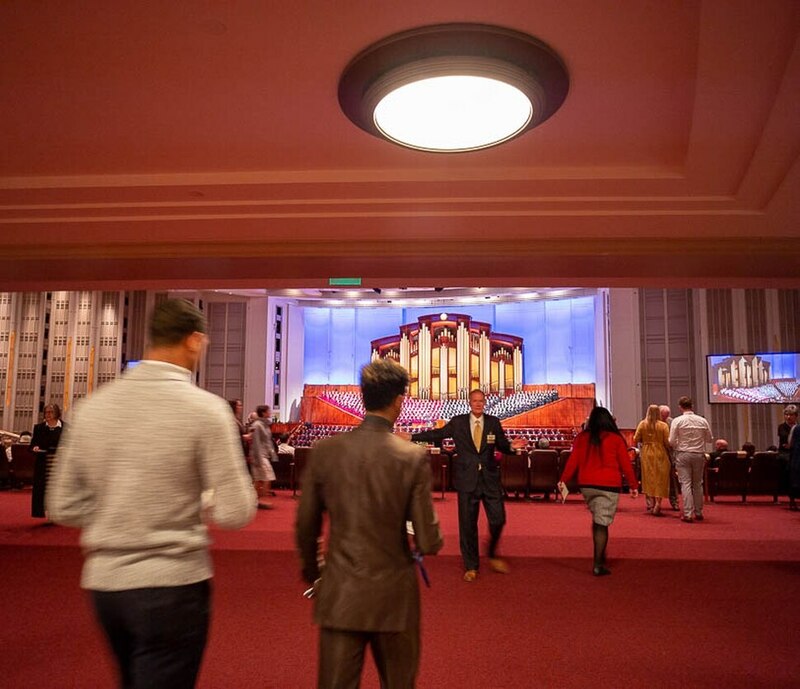 They must decide if a person is worthy of a recommend to attend the temple. Has a person whose name has been removed from church records repented to be readmitted by baptism? (Trent Nelson | The Salt Lake Tribune) Elder D. Todd Christofferson speaks during the morning session of the189th Annual General Conference of The Church of Jesus Christ of Latter-day Saints in Salt Lake City on Sunday, April 7, 2019. 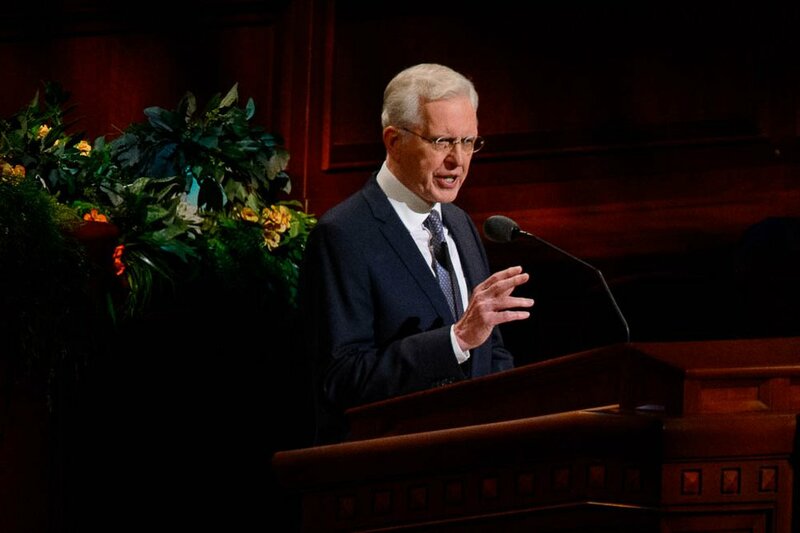 Apostle D. Todd Christofferson addressed the need to get ready for Christ’s return. So what do modern-day Latter-day Saints need to do before the Christian Savior comes? (Trent Nelson | The Salt Lake Tribune) David A. Bednar speaks during the afternoon session of the189th Annual General Conference of The Church of Jesus Christ of Latter-day Saints in Salt Lake City on Sunday, April 7, 2019. Apostle David A. Bednar focused his remarks on recent changes to the church’s Sunday School curriculum — intended to supplement home-centered study and family gospel discussions — and the importance of members preparing at home to enter one of the faith’s temples and participate in the faith’s most sacred rites. Bednar encouraged members to make use of church-produced information on the faith’s temples, while offering guidelines on how, when, and whether information on holy ordinances can be discussed outside the temples. Symbols or specific promises associated with covenants received in temple ceremonies are too sacred to describe or discuss outside of those edifices, Bednar said, but members can and should talk with family members, including children, about the basic purposes and principles associated with those covenants. His comments come barely three months after the church changed its temple rituals to feature women more prominently and use more gender-inclusive language. (Trent Nelson | The Salt Lake Tribune) Elder Dale G. Renlund speaks during the morning session of the189th Annual General Conference of The Church of Jesus Christ of Latter-day Saints in Salt Lake City on Sunday, April 7, 2019. Apostle Dale G. Renlund compared heavenly blessings to the building of a large fire, with kindling and wood chips covered by progressively larger logs. The wood pile may be ready to burn, Renlund said, but it still requires a person to strike a match, light the kindling, and a constant supply of oxygen to grow and maintain the blaze. He said God’s blessings are not received by collecting “good deed coupons” or by helplessly waiting to win a divine lottery. “You do not earn a blessing; that notion is false, but you do have to qualify for it,” Renlund said. “Our salvation comes only through the merits and grace of Jesus Christ." Apostle Quentin L. Cook urged parents to limit the use of distracting media in the home, and to make sure that the content their children encounter is wholesome, age-appropriate and consistent with a loving atmosphere. Fellow apostle Ronald A. Rasband also warned that humankind is in a fight with the devil. (Trent Nelson | The Salt Lake Tribune) Juan Pablo Villar speaks during the afternoon session of the189th Annual General Conference of The Church of Jesus Christ of Latter-day Saints in Salt Lake City on Sunday, April 7, 2019. Juan Pablo Villar, a general authority Seventy, talked about his conversion. When he was a teenager, Villar said, he visited his older brother, who had converted to Mormonism and was serving a mission at the time. Unfamiliar with such service, Villar expected to spend the day at the beach but instead accompanied his brother and his brother’s missionary companion on their proselytizing lessons for the day. A teary Villar said he witnessed people change as they were taught and how they “received spiritual light in their lives." He said he, too, learned even though he was never the direct recipient of his brother’s lessons. (Trent Nelson | The Salt Lake Tribune) The Tabernacle Choir at Temple Square during the afternoon session of the189th Annual General Conference of The Church of Jesus Christ of Latter-day Saints in Salt Lake City on Sunday, April 7, 2019.